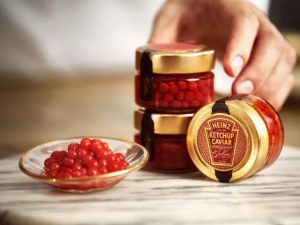 Heinz has launched a semi-fancy, Ketchup Caviar in time for Valentine’s Day. The caviar comes in jars and is in the form of ‘pearls’ of ketchup. The quirky condiment is only available in a limited number, 150 jars to be exact, and was only available through a competition via Heinz US on Twitter.